Alleged (2010) is a film that dealt with the teaching of the theory of evolution in Tennessee in the 20’s and the resulting 1925 “Scopes Monkey Trial” in Dayton, Tennessee. It also took on the issue of sterilization as one of the main characters Rose Williams (Ashley Johnson) has a racially mixed sister who is institutionalized because of this. John Thomas Scopes was defended by Clarence Darrow in this very high profile court case. William Jennings Bryan argued the case for the prosecution. The film starred Nathan West and Brian Dennehy and was directed by newcomer Tom Hines. 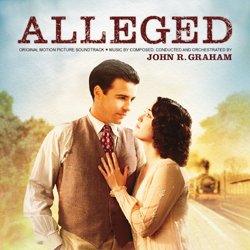 Graham chose strings only for the majority of the score along with an early 20th century made banjo, guitar, and used a ribbon mike that was also made in the 20’s. The composer is new to this reviewer and this is my first review of any of his soundtrack material. that is also ethereal almost lulling you to sleep with harp until without warning there is a forceful statement from the orchestra, including a rare appearance from the brass who offer a new melody which we’ll call the ‘Swinging Melody.’ It is bubbly, bright, and upbeat and is used in other tracks. The theme quickly disappears and the track ends in a peaceful mood. “Anticipating Riches,” continues with the ‘Swinging’ melody in a very period sounding piece, with toe tapping banjo, guitar, and some hoe down fiddling. “Ball Game” offers more of a period sound with guitar but also includes more of the laid back piano. This is a track which offers both the modern as well as the period sound. “Train Comes In” begins with a sound of train coming in and offers the ‘Swinging’ melody from the orchestra as well as the banjo in an upbeat track. “Reconciliation” repeats the ‘Colony’ theme in a delicate fashion on the piano with harmony from the strings. It is somewhat similar to the first track. “Leaving Town” begins with a Thomas Newman influenced underscore with flute, strings, and piano. It ends with a few rousing bars of the ‘Swinging’ melody. “Father’s Legacy,” “A Walk in the Woods,” “Charles Dilemma,” “Mencken,” and “Loeb and Loeb” are quiet underscore. “Roaring 20’s” repeats the ‘Colony’ theme this time using the violin, guitar, string bass, and banjo. It is a period sounding piece that is quite laid back and offers rhythm and color to conclude this soundtrack. I’m glad that MSM has brought this score to my attention. I wasn’t aware of the talent of John Graham and look forward to hearing more of his work. Overall this is an excellent offering with two great melodies that will stay with you for a long time. I like the listening balance between the period tracks and the soft dreamy underscore. The recording and mixing are well done. Tracks 2, 6, and 11 use mix samples and reels to enhance the sound. John did the arranging, conducting and orchestration for the score. Another winner from MSM!